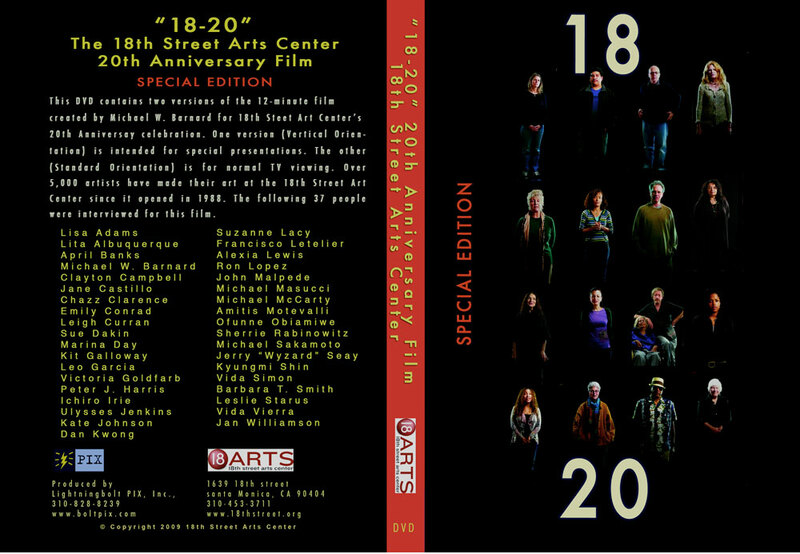 DVD Cover art for the Special Edition of "18-20"
In the Spring of 2009 the 18th Street Arts Center commissioned Michael Barnard and LightningBolt PIX to create a special event video for their 20th Anniversary fundraising dinner. Shooting vertical format High Definition video, Michael captured statements of nearly 40 artists who have come through the 18thStreet Arts Center since its inception in 1989. The resulting film was shown to great effect at the fiundraising dinner which took place on April 11, 2009. A DVD of the 12-minute film is available from the 18th Street Arts Center. Or watch the film below.